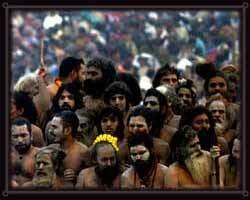 Kumbh Mela 2001 - The largest gathering of individuals for a religious purpose in the world. Maha Kumbha Mela is held in Allahabad every 12 years. It also takes place in three other holy places in India every 12 years - Haridwar, Ujjain and Nasik. The time for Kumbha-mela is judged by the astrological positions of Jupiter and the Sun. 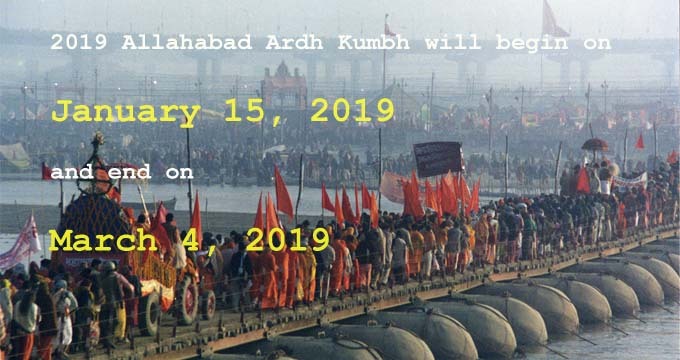 In Prayag (Allahabad) the Kumbha-mela takes place during January-February, when Jupiter is in Taurus and the Sun enters Capricorn. The Kumbha-mela in Prayag (Allahabad) is considered especially auspicious. This very interesting event draws about 15 million people and is the largest attended event in the world. A huge temporary city is created for the millions of pilgrims that arrive for the most auspicious bathing days. Kumbha Mela is like a Yogi Convention, where yogis, sadhus (saints), holy people, and pilgrims come from all over India. Many sadhus come from various holy places, the most remote forests, and mountain caves in the Himalayas. The most famous are the Naga Babas, who are completely naked. They cover their bodies only with ash and wear their hair in dreadlocks. It is said that if one bathes at the Sangam of the Ganges, Yamuna and underground Saraswati on one of the main bathing days during Kumbha Mela that one attains liberation. In the Vishnu Purana it says that one get a great benefit from bathing during Kumbha Mela than performing 1,000 Ashwamedha Yajnas (horse sacrifices) or circumambulating the earth 100,0000 times. It is said that by bathing at Kumbha Mela that all a person's sins are washed away and that 88 generations of ancestors are benefited. The main bathing days are known as Shahi Snans or Royal Bathing Days. The main bathing day, when the most people come, was on January 24, on the Mauni Amavasya day (the dark moon), when over 15 million people are said to have bathed. The next main day or Shahi Snan is said to be on Basant Panchami (fifth day of the new moon), January 29. I went to the Kumbha Mela for the important bathing day of Maha Sankranti on January 14th, 2001 (when the sun enters the sign of Capricorn), which is supposed to be the third major bathing day (Shahi Snan) of Kumbha Mela. On this day it is said that around five million people bathed. The festival began on January 9th on Paush Purnima (full moon). The two other main days are Magha Purnima (full moon) on February 8th and Maha Sivaratri (appearance day of Lord Siva) on February 21.